A uniquely powerful and easy way to generate income. The address business has an extremely low start-up cost and big profit potential. First you will need to make the address painting kit. Everything you’ll need can be purchased at your local hardware store. 1 Small bucket of exterior white paint and wide paint cup. 1 Can of black spray paint. 1-2 packages of basic cardboard number stencils. 1 Package of designer stencils. 1 Small plastic tool box to hold all the accessories. I’ve done this business first hand, it can be quite profitable and rewarding at the same time. It’s important to know that many home owners truly appreciate this service. I’ve been offered tips and bonuses. I was even offered 4 jobs including one as sales manager for one of my customers medium sized landscaping company. I turned it down as I was making too much with the address business at the time. In the past there have been two way to offer this service. One technique gains the respect and appreciation of the home owner and the other doesn’t. The one that doesn’t first. Don’t paint the address and then tell the home owner that you painted their address, and now you expect money. It destroys the business leaves you with no respect and turns a great business in to a charity event. Now the correct and much more profitable way. Yes you have to be somewhat comfortable talking with customers, you will need to knock on the door. This can be daunting at first to some, but once you break the ice it’s easy. The more comfortable you are, the easier it gets, and the more you make. Knock on the door or ring the doorbell then take 2-3 steps back. This gives the customer their space and makes them comfortable talking with you. Try to have some excitement, and a smile. Hi I’m name, how are you today? Great! You may know of me I’m the guy/girl that does the addresses in the area, you know the addresses with the white background and black numbers on the front street curb? since the emergency service vehicles often use these numbers as a reference when trying to find homes in the area, we doing a special. 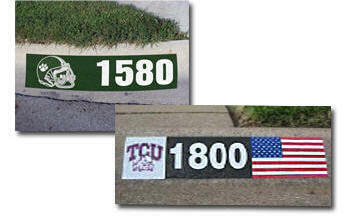 Today were doing all the numbers for just 10.00 plus we’re adding the “design” to side for free. (refer to the design, if you live in a desert area, do a cactus or kokopele, if you live in a big sports town do the team logo. Many times you will get a yes right away but if you get a no, that’s not the end of the sale. If you’re just getting started for the day, let them know that you will do the address numbers for only 8.00 and you will still give them the free design just to get you started! Le them know that since the emergency service vehicles use them that you don’t want them to miss out, so you will do it for a lesser price. You can take the price all the way down to 5.00 and still make 20.00 per hour all day long. The emergency services actually do use the address’s I learned this from a woman who’s address I painted. She told me how important they really are. She told me of a case that an ambulance couldn’t find her house because the addresses were not clearly marked on the homes in her old neighborhood. I would pass on that story to future customers. I would also let them know that everyone loves them and that they are guaranteed. If you don’t like it you don’t have to pay! ON some days I would average 40.00 dollars an hour. 10.00 bucks an address 4 per hour… My best hour? 90.00 dollars for 1 hours work. The only thing that stopped me from making more was simply the ability to be able to paint more in that time frame. If you were strapped for cash and wanted to generate income quickly. The worst you could possible do with the address business is 15.00 an hour… that would be 5 houses for 3 dollars or 3 houses for 5.00 each. Hey thanks I really appreciate that. I haven’t made many updates lately but will be getting underway soon. Maybe you should make changes to the webpage title The Address Business! | to something more specific for your webpage you make. I liked the blog post yet. Thanks for the tip I did change the title to something a bit more descriptive. This is just what I’ve been looking for! I got scammed last week and now I owe the bank $1500! This is exactly the type of idea I needed to get going.